Back in 2011, when David Petreaus was being considered as the new head of the CIA, an emissary from Roger Aiiles of Fox News called to urge him to run for President instead. She promised Petraeus the full backing of Fox News, and said Ailes would be willing to be his campaign director. I know about this because I came across an article written by Bob Woodward of the Washington Post on Dec. 4. The on-line version of the article has audio of the actual conversation. But the article ran in the Post’s Style section, as if it were just a bit of interesting celebrity gossip. For me, the article is much more significant, especially for what it says about the journalistic standards of Fox News. It is one thin to present the news from an avowedly conservative, or liberal, point of view. It is another to try to play kingmaker and put yourself in the bag for a particular candidate. The Rev. 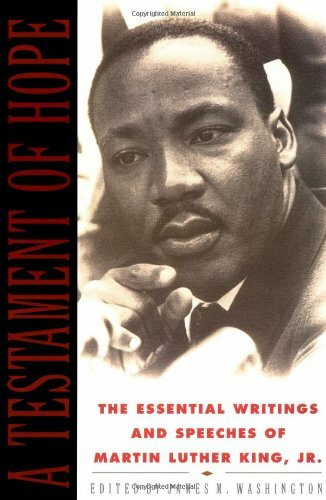 Martin Luther King Jr. wrote this 50 years ago. When the horizons of man’s destiny loom ashen and somber; when the deafening report of weaponry stuns yearnings for peace; when people are alienated from the outside society, spiritually isolated, and weary of heart; when a child is hungry, a father desperate, and a mother fearful – the beseeching question arises, where can one turn? This year that question is so relevant and contemporary, so deeply serious and urgent for all who will face it that all of us must search now for a reasoned yet comforting answer. We cannot deny the dreadful conditions found in our society and in the world. Global holocaust is no longer a mere technological possibility; it is a direct and escalating threat. The spirit of man everywhere has been dampened, and often his mind is engulfed in gloom. And there are millions of hungry children, defeated fathers, and frightened mothers in our land and others. We – these people, you, all of us – must have not only hope for the unknown future but also confidence in our capacity to change the menacing present. Let us put hands and heart, mind and muscle to this task. Let us not give up, for surrender and apathy are nothing but failure. In our work let us see scorn and ridicule of us for what they are – scornful and ridiculous. 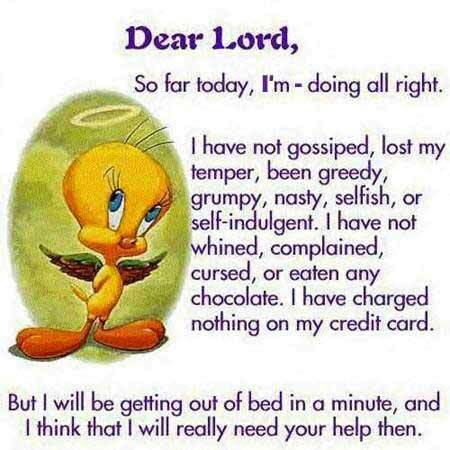 “Keep your hand on the plow,” the old spiritual admonishes. “Ain’t gonna let nobody turn me ’round,” the freedom song declares. This is a season when we can summon that kind of determination and bold purpose required to create inner peace and to commit external acts of good will. Peace and good will, the simplest and most elusive of dreams, the dreams of this season, begin with the individual before they can be extended to collective man. So let us begin with ourselves. If we as individual human beings will spurn selfishness, we shall appreciate the value of true love of self, and the exhilarating beauty of living. And if we recognize that all people can become truly alive and beautiful, we will understand the cosmic truth that all men are brothers and inseparable. Then we will see where we must go and how we must live. Real brothers cannot kill each other, are incapable of oppressing each other, and are utterly unable to hate each other because they are as one in the embodiment of dignity and respect. We who know we are brothers therefore have a duty to bring others back into the broken family of man and into our world house. In the context of the modern world we must live together as brothers or we shall perish divided as fools. The task is stern and provocative. Among the moral imperatives of our time we are challenged to work all over the world with unshakable commitment to wipe out the last vestiges of racism. Another grave problem that must be solved if we are to live creatively is that of poverty on both the national and international scale. A final problem that demands solution is finding an alternative to war and human destruction. Yes, the challenges are awesome but exciting too. This is a season when we can still take heart. We can be joyful that swelling masses are absolutely dedicated to the death of racism and a life of brotherhood. We can give thanks that the world at last has the ability and resources to end poverty and that more and more people are overcoming their blindness to the suffering poor. We can thrill to the burgeoning love of peace and the devotion to it. 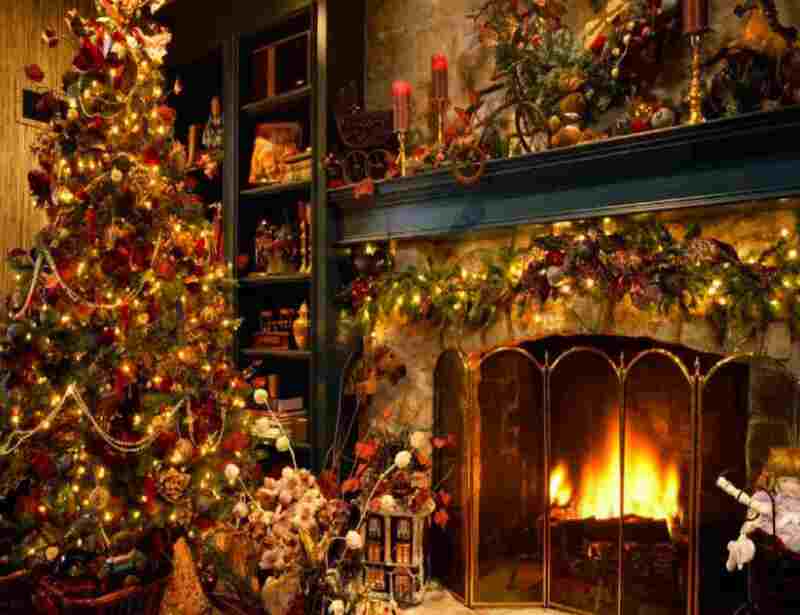 We wish you and your a joyous Holiday and a New Year of fulfillment. via Martin Luther King letter. Tags:Christmas Message, Rev. Martin Luther King Jr.
Al Jazeera English discusses how Americans have come to regard torture not as a crime, but as an option about which reasonable people can differ. Not so the European Court of Justice, which is trying to bring torturers to justice. Lately I’ve been reading histories of World War Two, when we Americans regarded ourselves as fighters for liberty. Now many people in democratic nations are coming to regard us as the enemies of liberty. What will we do when they are no longer intimidated by our power? We liberals see a strong government as necessary to protect individuals against the abuses of big corporations. The problem is that government does not necessarily operate this way. What we have in the United States today is government increasingly interfering in the lives of individual citizens, while giving free rein to the heads of large corporations. 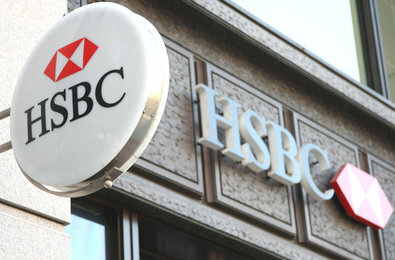 A recent example of this was the decision of the U.S. Department of Justice to refrain from prosecuting executives of HSBC, a big international bank based in London, for laundering money of the drug cartels because that would be disruptive to the financial system. It is a mistake to talk about “big government” and “big business” as if they were people. They are organizational structures through which people can do bad things or good things, but very often can be shielded from the responsibility for the bad things they do. You can’t punish an organizational structure, or hold it accountable. Only the individual human beings within the structure are accountable. Libertarians say that the only way to limit the abuses of government is to limit the authority of government. They say that if you don’t want governmental officials to have the power to bail out banks, they shouldn’t have the authority to bail out anybody. My problem with that argument is that this tradeoff isn’t on offer. Cutting the Social Security pensions of 80-year-old widows won’t do a thing about bankers giving themselves bonuses with taxpayers’ bailout money. Click on Outrageous HSBC Settlement Proves the Drug War Is a Joke for Matt Taibbi’s comment. When I learned to drive a car, many years ago, I was told to always keep both hands on the steering wheel, which I pretty much do. But in the past year or so, I’ve been in cars with people whom I know to be safe, conservative drivers generally, and who yet start their cars from a standing position with both hands raised in midair. As the car starts forward, they let the hands slowly fall to the steering wheel. Sometimes they’ll take their hands off the wheel when the car is moving straight forward. Many of the people who drive like this are people I regard as conservative, safe drivers. 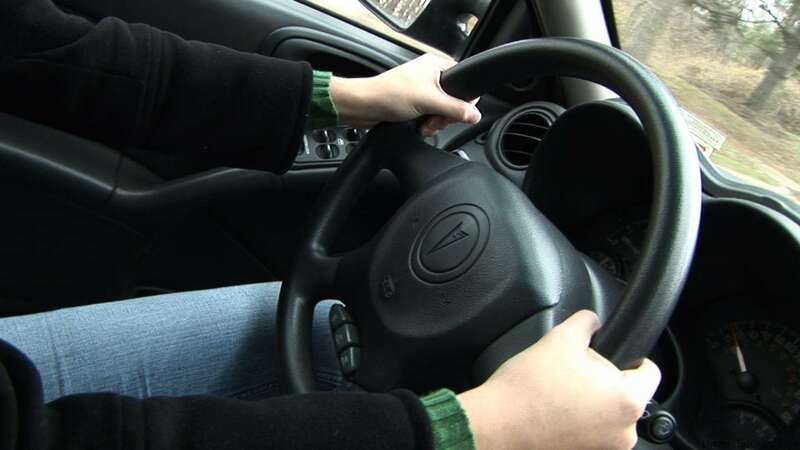 It seems strange that I never noticed anybody driving without hands on the wheel before, and now many people seem to be doing it. Am I right in thinking this is something that is becoming common? Am I right in thinking this started just started a few years ago? How did this new habit come into being? In the little town in which I grew up in the 1940s, we children used to look forward to the annual Firemen’s Carnival—a fund-raising event for our volunteer fire company. 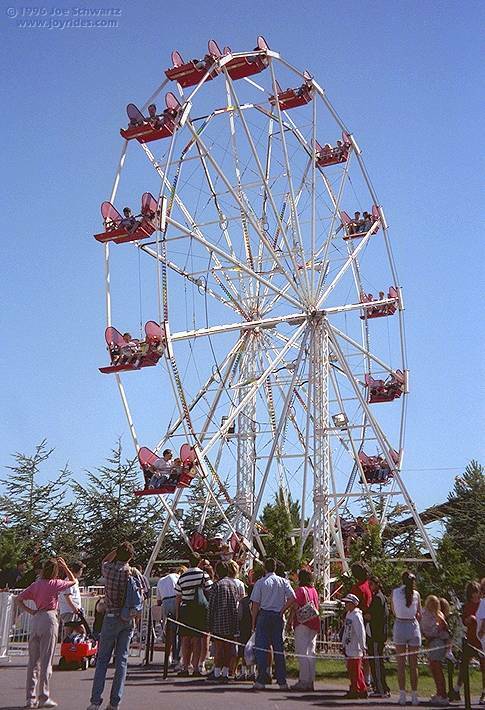 I’d save my money, and, when the day came, I’d ride the Ferris wheel and the other rides, I’d try to win prizes in the carnival games, and I’d buy cotton candy and drink sugared drinks. Eventually dusk would come, my money would be spent, I’d be tired and cranky, but I didn’t want to go home. I’d want the carnival to go on forever. I’m 76 years old today, and I’m at the dusk of my life. I’m getting tired and cranky, but I don’t want the carnival to end. There are still rides I want to take and there are still games I want to play. I accept that there is, and has to be, a closing time, but I’m not ready to go home and go to sleep. Not just yet. 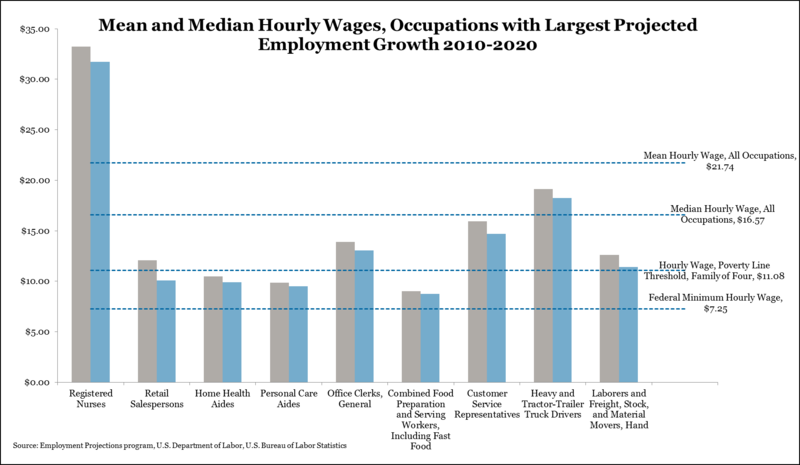 Click on Raising American Wages … By Raising American Wages for a well-researched, well-thought-out article by Ron Unz, publisher of The American Conservative, on the case for a higher minimum wage, and why this would do more for the U.S. economy than another stimulus spending package, another round of tax cuts or getting more people into higher education. Indeed, he makes the case that a higher minimum wage would decrease the demand for higher education, and that this would be a good thing. I first noticed Ron Unz when I read his excellent articles on bias in Ivy League college admissions and the myth of meritocracy. 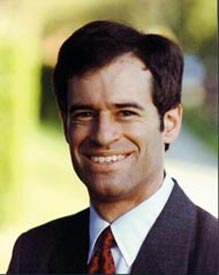 Click on Ron Unz – Writings and Perspectives | Views, Opinions and Notes for more of his writings. If we return to Clinton-era tax rates, taxes will still be low by historic standards. 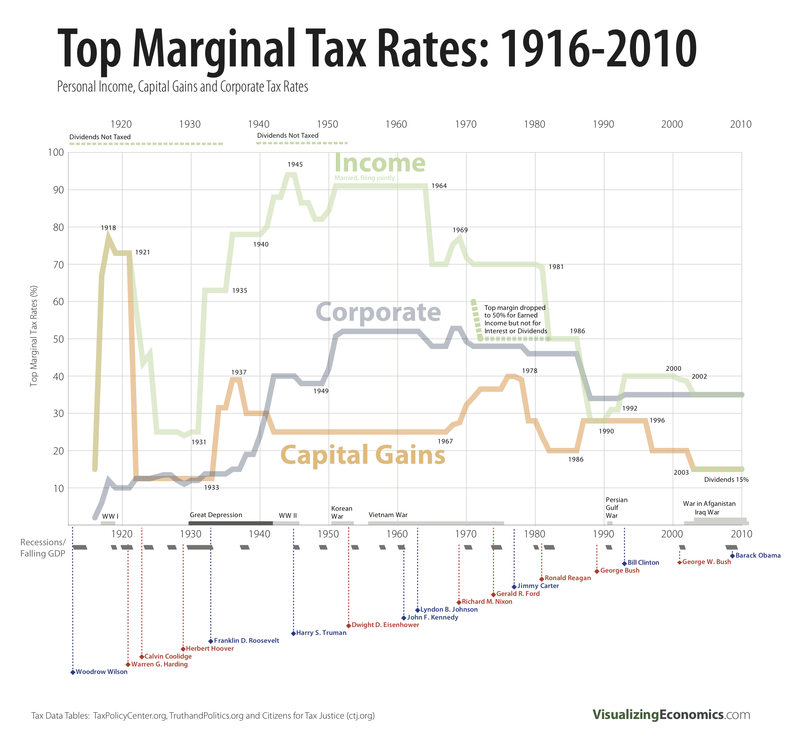 Keep in mind that the tax rates shown are only the top marginal rates, paid on income above a certain threshold. Most people, including the very rich, are taxed at a lower overall rate. Hat tip to The 21 Blog. Will Obama sell out seniors on Medicare? Journalists with inside information on the Obama administration are floating the idea of raising the age of Medicare eligibility from age 65 to age 67. They say this would be a small price to pay in return for a grand bargain with Republicans in Congress to raise taxes on incomes above $250,000 from 35 percent to 37 percent. This is a terrible idea, but that’s not a reason why President Obama won’t propose it, or that it won’t go through. 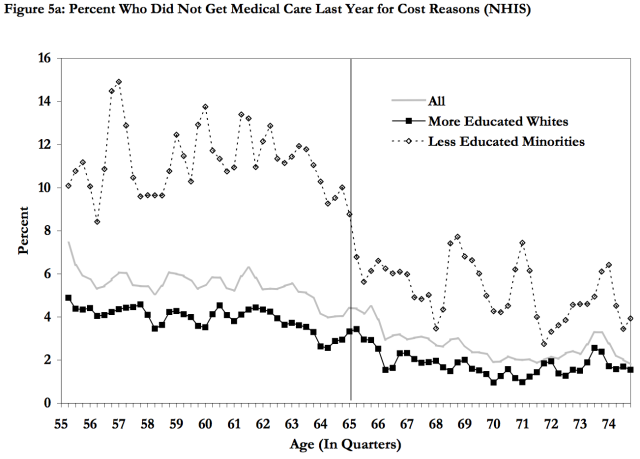 As these charts show, people—especially poor people— do postpone needed medical treatment because they can’t afford it. 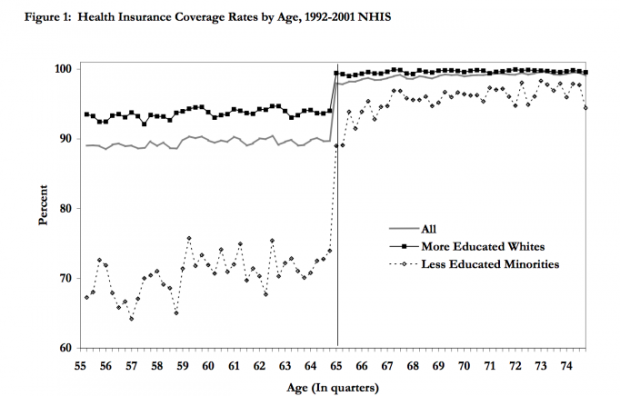 As a negotiating position, raising the Medicare age doesn’t make any sense. President Obama would be selling out the interests of elderly poor people and while at the same time giving up on his mild proposal to restore the Clinton era tax rates. The explanation is that the President accepts the Washington consensus that it is necessary to cut “entitlements.” By offering entitlement cuts as part of a grand bargain, he can finesse the deal and bring Democrats along. The great thing about bipartisan agreements is that nobody is responsible. I think that cutting entitlements is President Obama’s goal. He offered to raise the age of Medicare eligibility in negotiations in 2011. I think he believes he is being a statesman who sees beyond the narrow interests of his constituents. But whatever it is, the only way to stop it is for working people to notify their congressional representatives that this is unacceptable. Click on Is Obama Selling Us Out on Medicare? for Joan Walsh’s misgivings in Slate. Click on The fiscal cliff deal becomes clearer for Ezra Klein’s trial balloon in the Washington Post. Click on Go Ahead, Raise the Medicare Retirement Age for Jonathan Chait’s trial balloon in New York magazine. Click on Jonathan Chait’s Miserable Endorsement of Raising the Medicare Eligibility Age for David Dayen’s rebuttal on FireDogLake. 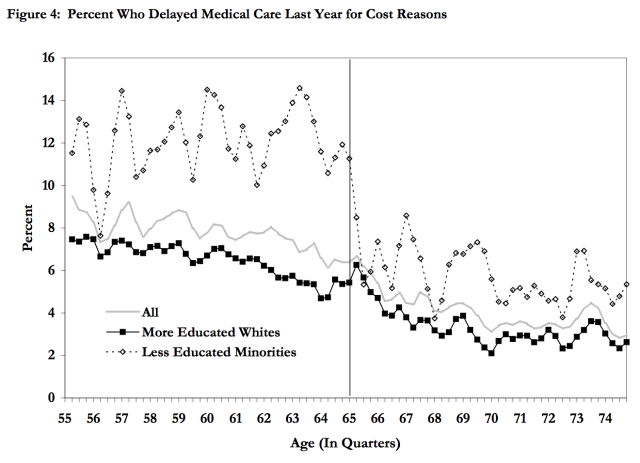 Click on Raising Medicare retirement age would cost patients twice as much as it would save the government for Matthew Yglesias’ analysis for Slate. Click on Medicare Eligibility Age on the Table? for Adele Stan’s thoughts in the Washington Monthly. For President Obama in 2011, click on Obama Offered to Raise Medicare Eligibility Age As Part of Grand Debt Deal from the Huffington Post. If this isn’t something he wants to do, why does he keep bringing it up? Hat tip to Owen Zidar for the top three charts. In my previous post, I wrote about an article by Ron Unz in The American Conservative about admissions policies at Ivy League universities, and their disparate impact on different ethnic groups, in particular the seeming unfairness to smart Asian-American applicants. In this post, I want to write about a broader question, the role of the Ivy League as gatekeepers to the elite. I remember a remark by President Obama some time back about how he recognized that hedge fund managers, by and large, were smart people because many of them had been his college classmates at Harvard. It is an illustration of how the top people in Washington, Wall Street and academia form an inner circle. Part of Obama’s success is due to the fact that, in spite of his middle-class origins, he was able to make a favorable impression on people in top positions. I have a problems with the whole idea of an elite group with gatekeepers who decide who gets in. 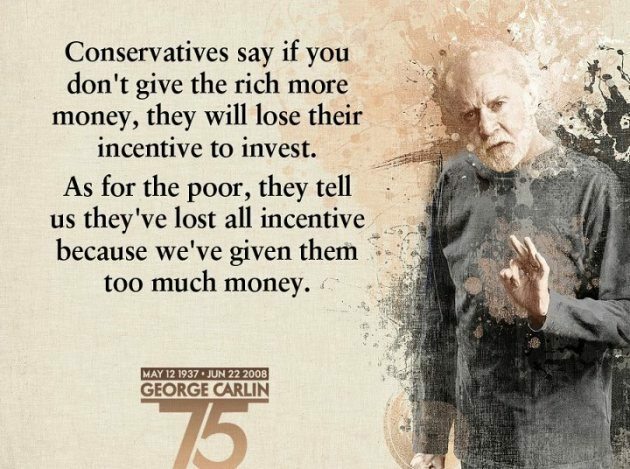 This goes against what I was brought up to believe that the United States was all about—that an Andrew Jackson or an Abraham Lincoln could become President, a Thomas Edison could become a great inventor or an Andrew Carnegie or Henry Ford could become a great industrialist, without any of them having to produce formal credentials to show their entitlement to a high position. True, we live in a society in which people in top positions need to have more specialized knowledge than they did in an earlier era. But that knowledge can be acquired in many places, not just in a few elite universities. In the past couple of decades, the United States has had an increasing concentration of wealth at the top, a decline in upward mobility among American social classes, and a declining quality of leadership in government and corporate America. (If you doubt the latter, then you are happier with the American economy and the American position in the world than I am.) If the elite class and its gatekeepers did indeed produce superior leaders, I wouldn’t be so critical of the process by which they are selected. The anecdotes in Unz’s article raise the delicate question of “political correctness.” This does not apply to the sons of privilege, such as Mitt Romney (Brigham Young BA 1971, Harvard MBA & JD 1975) or George W. Bush (Yale BA 1968, Harvard MBA 1975), who are assured an admission no matter what their opinions might be. But for someone from a more modest background, such as Barack Obama (Columbia BA 1983, Harvard JD 1991) or Bill Clinton (Georgetown BS 1968, Yale JD 1973), a lot would depend on the interviewer’s subjective impression. I find it easy to imagine, but impossible to prove, that an interviewer could have a political bias that a high school student who campaigned against the death penalty probably was a well-rounded person, but somebody who campaigned in favor of the death penalty was intellectually and morally backward. I don’t have any direct knowledge of this, and would appreciate comment from anybody who does. I bring this up only because the comment thread on Unz’s article indicates a widespread perception that this is indeed the case. To the extent a university wants to claim that it is highly selective, admissions should be based on test scores. To the extent a university wants to claim that it is diverse and “looks like America,” admissions should be based on a lottery of everyone who meets minimum qualifications. I don’t think there is any chance the Ivy League universities will accept such a proposal, and I don’t favor the federal government regulating admissions to private universities. What is needed is a change in attitude, in which people are judged based on their achievements and proved capabilities, rather than their credentials. This will be a long time coming, because so much of the existing elite was chosen precisely because of their credentials. Equal opportunity should be provided by state universities, with, as in an earlier era, free or affordable tuition to everyone who can do college work. And educational and charitable institutions with huge investment portfolios should be required to devote a minimum percentage of those portfolios to their official purposes, or forfeit their tax exemptions. Click on The Myth of American Meritocracy for Ron Unz’s full article. Click on Paying Tuition to a Gigantic Hedge Fund for a sidebar by Ron Unz claiming that Harvard University is more of an investment fund than an educational institution. Click on Harvard as Hedge Fund: Harvard Replies for Harvard’s reply and Ron Unz’s additional comment. Click on Quantitative Sources and Methods for Ron Unz’s documentation of his claims. Click on Ron Unz – Writings and Perspective | Views, Opinions and Notes for his web log. Degrees from the Ivy League colleges — Harvard, Yale, Princeton, Columbia and their peers — are passports to elite positions on Wall Street and in Washington. 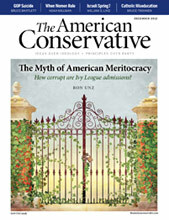 This month’s issue of The American Conservative carries an important article by its publisher, Ronald K. Unz, making the case that the Ivy League admissions process is corrupt and arbitrary, and that their student bodies are neither the best and the brightest, nor representative of the nation as a whole. Unz, himself a Harvard graduate, said the admissions process at Ivy League universities is a subjective process, based largely on interviews supposedly to determine whether the applicant is a well-rounded person. This system came into existence as a covert means to cap the numbers of Jewish students without setting explicit quotas, he wrote; now it is used to cap the numbers of Asian-Americans. A century ago, students of the Ivy League were predominantly the sons and the white Protestant upper class, who attended as much for social life and sports as for academics. Unz said applicants from such backgrounds, the children of distinguished alumni or large contributors to the college endowment funds, still get in as a matter of course. Some provision is made to help black and Hispanic students. The losers are Asian-Americans and non-Jewish working-class whites. I am uncomfortable with sweeping generalizations about broad racial, religious and ethnic categories. Each consists of sub-groups which differ from each other, and each group and sub-group consists of unique individuals with a wider range of traits than the averages of the different groups. You can’t tell anything about an individual’s intellectual attainments, or anything else, based on their demographic characteristics. But unfortunately, race, religion and ethnicity matter in American life and simplifications and generalizations are necessary for understanding. 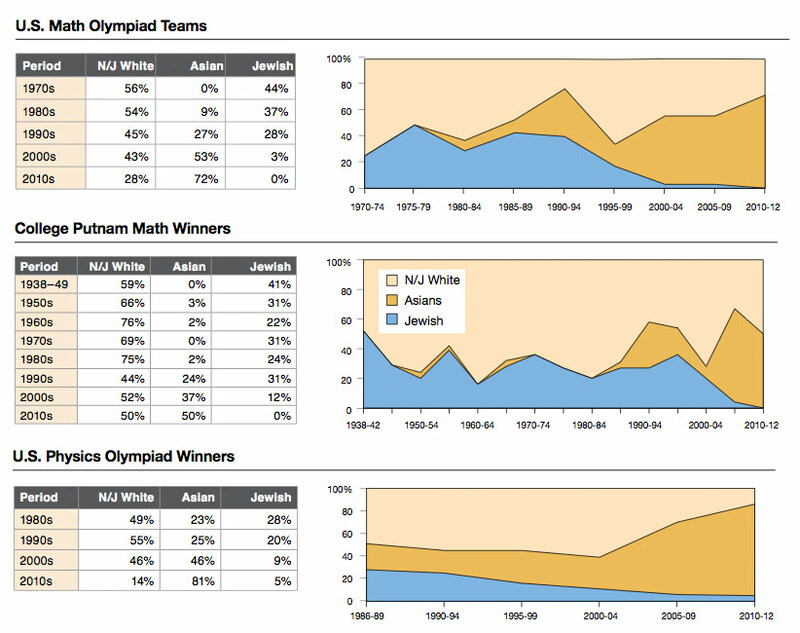 The following tables show the relative rise of Asian-American students and the relative decline of Jewish students in high school math and science competitions. The charts above indicate that Asian-Americans don’t get a fair shake, based on their intellectual attainments. 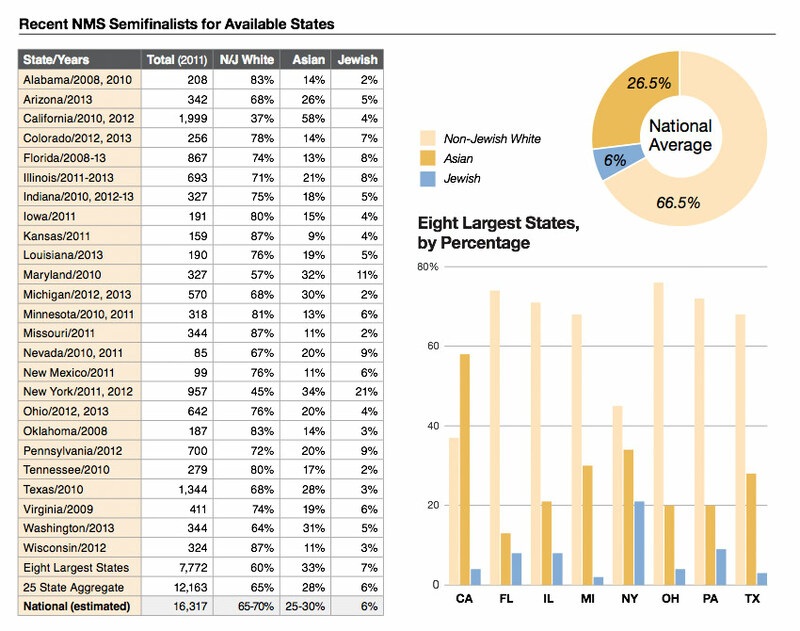 They indicate, more surprisingly, that average Jewish intellectual attainment has crashed. The percentage of Jewish high school students who win science competitions has declined dramatically in the past couple of decades, but not the high percentage of Jewish admissions to Ivy League universities—in sharp contrast to admissions to California Institute of Technology (Caltech), where enrollment seems to be based more on intellectual merit or at least on test scores. Asian-Americans stand in the same position in American academic life that the children of Jewish immigrants stood 75 years ago. 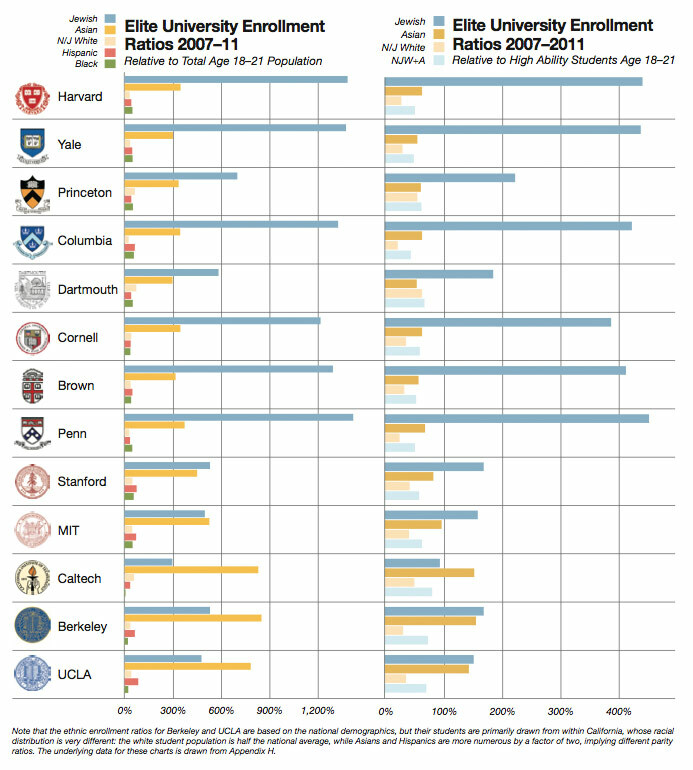 The implication of the data is that the reason for large numbers of Jewish students currently at Ivy League colleges is not that so many of them are hard-working, intellectual super-achievers as in previous generations, but that so many of their parents are members of the upper classes. 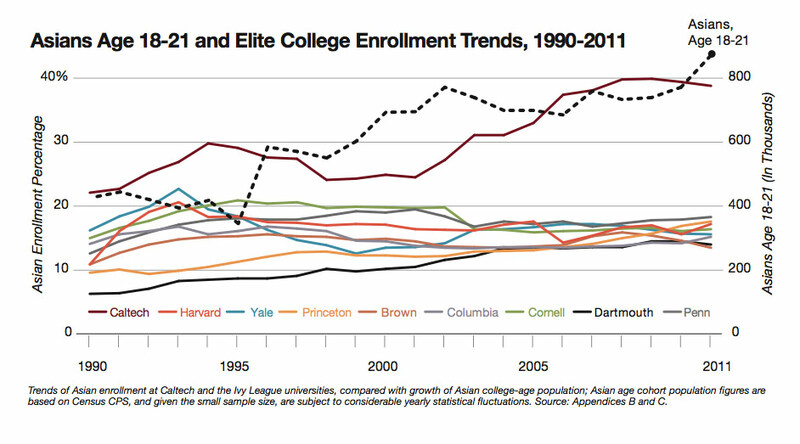 The Asian-American population is increasing, but their enrollment in elite colleges—except for Caltech—is not. The most obvious explanation is that there are quotas—explicit or informal—that are holding them back. 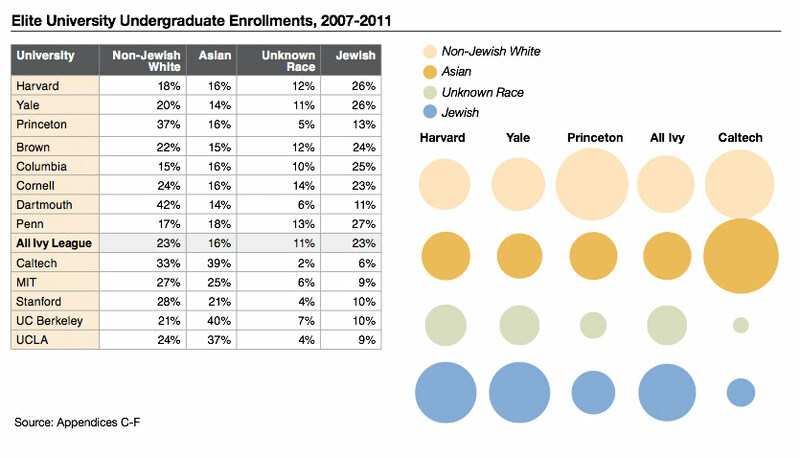 I’m uncomfortable with Unz’s article and the information in these charts, especially the implications concerning Jewish enrollment in Ivy League universities versus white Christian working-class people—implications which will be welcomed by racists and anti-Semites. But facts and logic are the best guide to truth, not my comfort level. One criticism of Unz’s article is that he counts people in different ethnic groups based on their last names. This may not be valid, especially when so many Americans are of mixed heritage. My name is Phil Ebersole. During my lifetime, many people have made wrong assumptions about my race, religion and ethnicity, based on my name and appearance. Another criticism is that Unz’s claim of declining Jewish intellectual attainment is based on declining high school science prizes, and this doesn’t take into account attainments in literature, philosophy and scholarship. Maybe Jewish intellectual interests have shifted from the sciences to the humanities. Maybe smart Jewish students all flock to Harvard, Yale and Princeton and smart Asian-American students flock to Massachusetts Institute of Technology (MIT) and Caltech. I think both these criticisms have merit, but do not invalidate Unz’s conclusions. I’ll be interested to see more commentary on his article. I’m surprised there has been so little criticism so far. I will have more to say in my next post. Double click on the charts to enlarge them. Click on The Myth of American Meritocracy for Ron Unz’s full article. All the charts above are from this article. For rebuttal, click on Meritocracy, Jews and the Liberal Arts by Samuel Goldman. For more comment, click on The Myth of Affirmative Action by Dan McCarthy. Click on Harvard as Hedge Fund: Harvard’s Reply for Harvard’s rebuttal and Ron Unz’s additional comment. 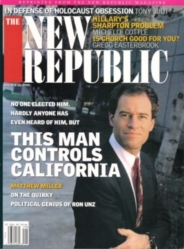 Ron Unz was born in 1961 and grew up in California. He earned a bachelor of science degree in physics from Harvard and studied advanced physics at Stanford University but didn’t get a doctoral degree. He started a software company called Wall Street Analytics which was bought by Moody’s Investors Service in 2006. He was active in California politics, and founded English for the Children, an organization opposed to bilingual education. He became publisher of The American Conservative in 2007. 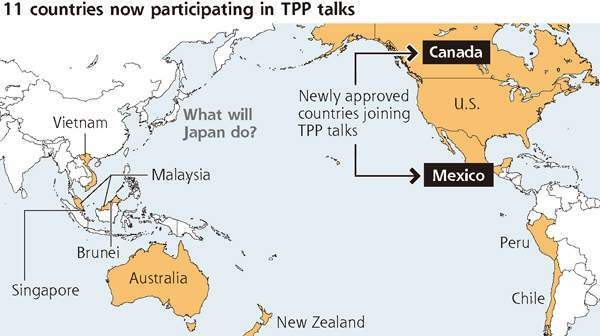 The secret Transpacific Partnership Agreement negotiations aren’t being covered by the mainstream U.S. press, that I know of, so I have to rely on Al Jazeera English for in-depth coverage. 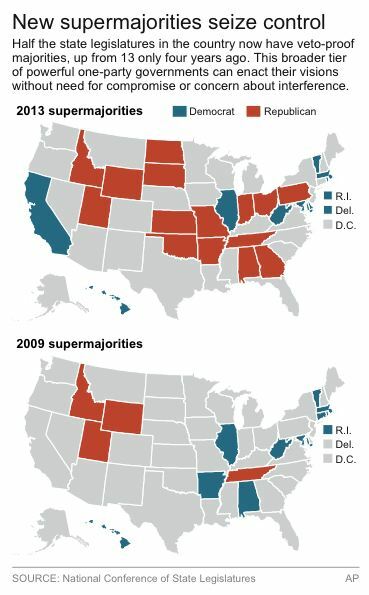 There is an increase in the number of states where one party or the other has a veto-proof majority in the state legislature. To the extent that this represents the will of the people and not just creative legislative redistricting, I think this is a good thing, not a bad thing. It means the states can be laboratories to test the ideas represented by the respective parties. Representatives of 11 Pacific nations are currently meeting in secret in Auckland, New Zealand, from Dec. 3 through Dec. 12 to negotiate a new “free trade” treaty called the Transpacific Partnership. 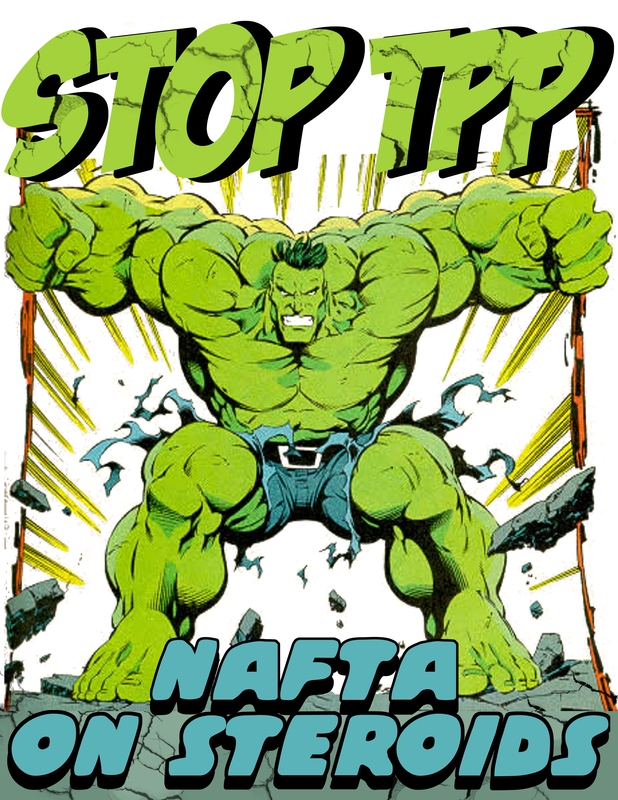 Leaked information, including documents obtained through Wikileaks (thank you, Julian Assange), indicate that the TPP would set up an international organization with power to override national governments in environmental, health and labor regulation, and in copyright and patent law. If private businesses don’t like the laws and regulations of the countries in which they operate, they would be able to file suits claiming these laws violate the TPP. If they win, they could collect damages from taxpayers of those countries. Congress has been denied information as to what is being proposed or the U.S. negotiating position, but roughly 600 business representatives have been allowed in as so-called consultants. The Electronic Frontier Foundation and other public interest organizations sent representatives to the meeting, but they were barred, except to deliver brief statements of their views. One nation that is not invited to participate is China. This may backfire. Forced to choose, Japan and other Pacific nations might prefer to join a Chinese-supported trade grouping called the Regional Comprehensive Economic Partnership. Click on Digital Rights Groups Shut Out of Secret TPP Negotiations for a report from the Electronic Frontier Foundation. I’ve long believed that the best way to understand yourself is to observe other people, and the best way to understand other people is to look inside yourself. We human beings are not all that different from each other. This new RSA Animate video by a philosopher named Roman Krznanc is about the power of empathy – the ability to imagine yourself in someone else’s place – as a means of self-understanding and as a means of understanding the world. Click on RSA Animate for more videos. All the RSA Animate videos are well worth watching, except the one featuring Slavoj Zizek. If you follow my web log at all, you know that I like maps and charts as a way to convey information. There is a lot of good information in the map above. One of the things that this map shows is that most of the world gives some sort of acknowledgement of the existence both the Israeli and Palestinian nations. The biggest exception is a bloc of Muslim nations, including all the nations except Egypt and Jordan that declared war on Israel in 1948, plus Bhutan (!) and North Korea. Even though the United States is Israel’s chief ally and supporter, the governments of Iraq and Afghanistan, which were put in power by the United States, refuse to recognize the legitimacy of Israel as a nation. Likewise Saudi Arabia, Pakistan and Indonesia, all U.S. allies, refuse recognition. Very few nations are found on the corresponding opposite side, refusing to acknowledge the existence of Palestine as a nation. They are all minor countries—South Sudan, Guatemala, Panama, the Dominican Republic, Haiti, Jamaica, the former Yugoslav Macedonia, Armenia and Burma (Myanmar). The United States and most U.S. allies recognize Israel, but have some sort of acknowledgement of the Palestinian nation. Most of the rest of the world recognizes both countries, which is what the United States ought to do. This is all very interesting, at least it is to me, but only two nations on this map really count, and they are Israel and Palestine themselves. It is up to the leaders of these two nations to determine when Israel will be at peace and Palestine will be free. I used to sympathize with Israel because I thought of the Israelis as the underdogs, and I thought the Israeli people were under a threat to their existence. I don’t think that is true any longer. Zionist leaders at the turn of the previous century believed that Jewish people would forever be persecuted minorities in the countries in which they lived, unless they, like other peoples, had a homeland of their own. During the early 20th century, some prominent Jewish people opposed Zionism. They said Jews were adherents of a religion, not a separate nation. To say otherwise, they said, would only validate anti-Semites who denied that Jews could be patriotic citizens of the nations in which they reside. The rise of Naziism confirmed the fears of the Zionists. Being patriotic did the German Jews no good. The immediate impetus for the creation of Israel was the failure of the Allies to address the refugee problem after World War Two. If the United States and other countries had been willing to take in Jewish people and others in Displaced Persons camps after World War Two, the Jewish people in the camps might not have tried to get to Israel at all costs. I don’t blame the founders of Israel for trying to establish a new Jewish state. 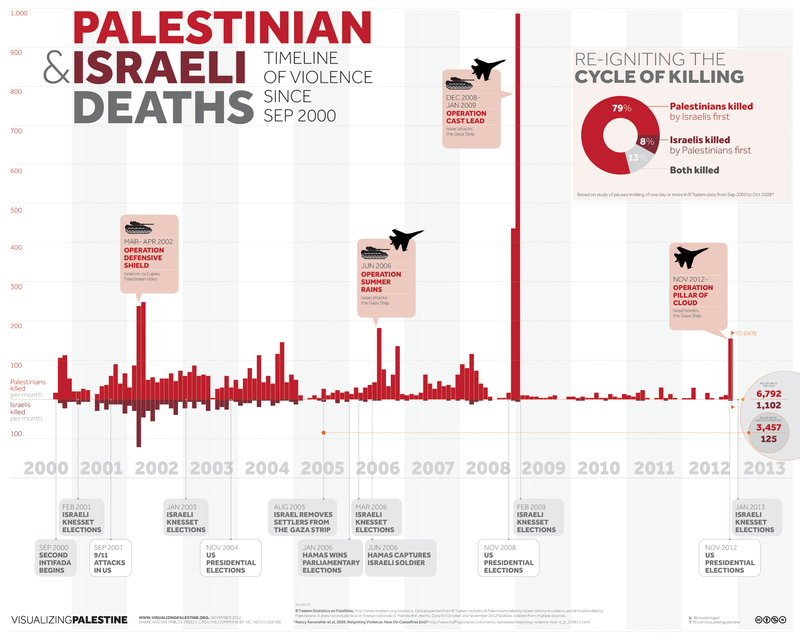 I don’t blame the Palestinian Arabs for fighting back. One of my mother’s favorite sayings that that two wrongs don’t make a right. But sometimes two rights make a wrong. Jewish people have a deep fear of being wiped out. Nobody who is familiar with history could say that fear has no basis. The Arab League declared war on Israel in 1948 with the intention of wiping out the new nation. 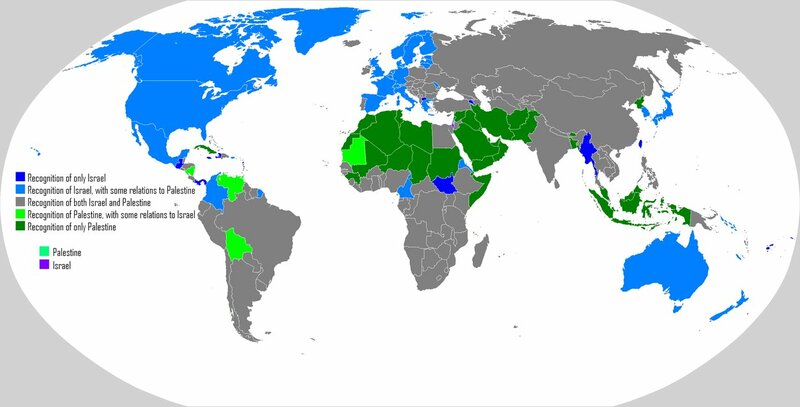 The map above shows the nations that declared war on Israel; the nations in dark green were the ones that put troops in the field. Later on the Soviet Union allied itself with anti-Israel nations. The Soviets were an open-ended source of arms for Egypt and Syria in waging war against Israel. In that situation, it was only right that the United States maintain a balance by arming Israel. But that situation no longer obtains. Israel is no longer threatened by neighboring countries, even the ones who refuse to recognize its legitimacy as a nation. Instead Israel is waging war on a subject people, the Palestinian Arabs, a people who have as much right to exist as a nation as the Israelis did in 1948, and who have as few alternatives as the Israelis did back then. But most of Israel’s American supporters think that Israel is as embattled and surrounded as it was in 1949 or 1956 or 1967. It’s time to look at the new reality. 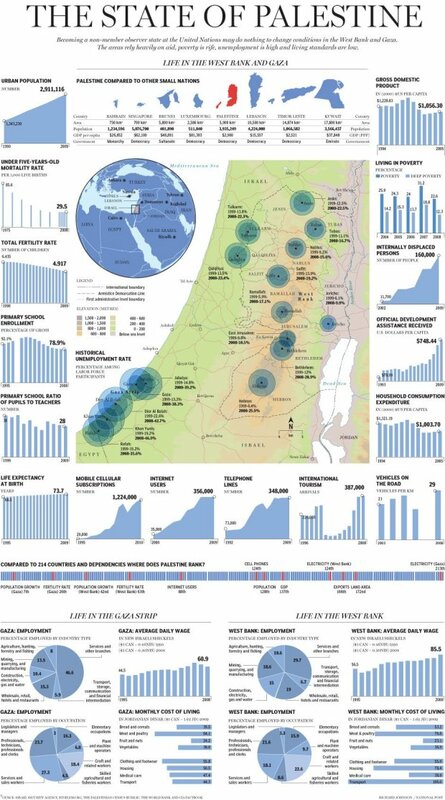 Click on Visualizing Palestine for more graphics. Why don’t the Palestinians just give up? I just got finished reading Max Hastings’ great new book, Armageddon: The Battle for Germany, 1944-1945. The book is a vast panorama of human suffering, including an episode almost forgotten today—the ethnic cleansing of the Germans from eastern Europe and from the German territories of East Prussia and Silesia. German families were sent out onto the roads in winter with what they could carry on their backs, to survive as best they could. As many as a million perished. But after the suffering inflicted on the world by the Nazi regime, few had any sympathy for the plight of German people. I described this to a friend of mine, and he wondered why the Palestinian people can’t accept defeat as the Germans did. There are winners and losers in war. The Palestinian Arabs are the losers. Why can’t they accept that? I forget what answer I mumbled in reply, but it wasn’t a good one. The real answer is that this is not a question for me or my friend to decide. The Irish were defeated time and time again by the British, but they never accepted defeat and eventually won their independence. On the other hand they came to accept the partition of Ireland as the price to be paid for peace. The nation of Poland was wiped off the map not just once, but twice, and the Poles reconstituted themselves as a nation. The people of Chechnia and Kurdistan fight on for independence even though their causes seem hopeless. Jewish people created a new Israel thousands of years after the original Israel was destroyed, and Armenian people have a new Armenia thousands of years after the old Armenia vanished. The question is not whether the Palestinian Arabs have been defeated. It is whether and when they will accept defeat. This video pretty much sums up the Israel-Palestine situation as I see it. I think it is to the credit of Israel that such a video could be made and discussed in that country. Such freedom exists in few, if any, of the countries that are Israel’s avowed enemies. 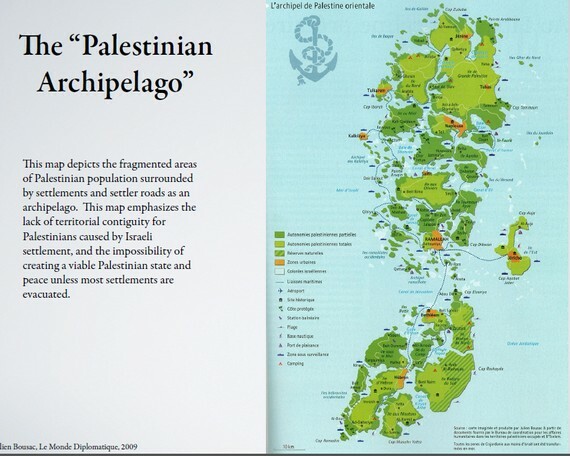 This in itself is a reason why Israel should not be erased from the map of history. Click on Jewish Voice for Peace for more from the makers of the video.